Kurt Gibson with Doublewide in 2012. Photo: Christina Schmidt — UltiPhotos.com. Well, we got what we were all expecting: Doublewide v. Bravo in the finals of the South Central. However, it wasn’t quite the battle of the titans that occurred in last year’s matchup. Doublewide took care of a somewhat short staffed Johnny Bravo team 13-8 after both teams easily romped through pool play and showcased a little bit of that dangerous side that we (and they) have been waiting to see all season. Neither team’s O-line looked particularly smooth to begin the contest, and even though the game was knotted at two after the first four points, both teams seemed willing to take their shots on offense, resulting in multiple turnover points. However, it was Doublewide’s ability to force multiple turns, and have Kurt Gibson on the field to quarterback the D-line offense, that really set them apart. An Andrew Watson layout block and an uncontested strip in the endzone on Dan Emmons brought the game to 4-2, and then Gibson again went out with the D-line, playing deep-deep in their vaunted four man cup. Doublewide’s size forced a hammer that was broken up, and Tim Gehret and Gibson did what they do best: marched the disc up the field and jammed it in with a series of inside breaks to make the game 5-2 in favor of Doublewide. Gibson trotted out frequently, playing with both Gehret and Brandon Malecek on the O-line and D-line, respectively. It was clear he is still their engine, getting the disc every other on offense, and often drawing the Jimmy Mickle matchup when Doublewide switched to man. Speaking of Mickle, he had his work cut out for him this weekend. Nick Lance was absent, attending a wedding and Eric Johnson and Bart Watson were also notably not present, with Stanley Peterson in sneakers on the sideline, wearing a knee brace. So as you can imagine, Mickle was everywhere. Whereas it was often Nick Lance who would switch over to the O-line during important junctures during the season, this time it was Mickle switching lines, sometimes playing four or five points in a row, trying to keep his undermanned Bravo squad afloat. Following Doublewide’s run of breaks to make it 5-2, the teams traded for a bit, with Mickle involved in every offensive score for Bravo. He was the best player on the field, catching an upline from a Ben Lohre around break, throwing a massive breakside scoober to the opposite corner of the endzone, and getting up huge over Dalton Smith with his left hand. The next point, Mickle’s last back help on a Malecek huck could have been the turning point of the game, as Bravo punched it in for their first break of the game, making it 7-6. Gibson answered, however, taking Doublewide to half at 8-6 with a gorgeous opposite corner flick huck to Kiran Thomas. Mickle wasn’t done yet. He came out of half just as involved, forcing a turn, and then skying Gibson in the endzone for another Bravo break. However, Mickle’s efforts just weren’t enough. A Driscoll score, and two straight breaks by Doublewide would all but put the game away, as they went up 11-7 and the soft cap sounded. A few Bravo turns later, and the game was over, with Doublewide taking the South Central title 13-8. Doublewide never really relinquished control of the game, smothering Bravo’s handler resets when Mickle got rid of the disc, and not allowing Bravo’s defenders to do the same to their own resets. However, there might be one cause for concern for Doublewide: the disappearance of Will Driscoll. The knock on Doublewide all season long has been how much they have relied on Kurt Gibson to run the show. This particular game didn’t do much to help dissuade the notion. Gehret and Smith were certainly more involved in the defensive handler position than they used to be, and Malecek had his moments of brilliance on offense, but at the end of the day, Gibson’s usage rate was off the charts. Driscoll, on the other hand, save for a few catches and a score, was quiet. Isolations were few and far between, and if you didn’t know how involved he was in last year’s offense (very), you might think he was just another generic O-line cutter. Some of that might be attributable to Driscoll’s place of residence in Portland, and the fact that he hasn’t practiced much with the team. However, you would think with a talent like his, Doublewide would try to get him involved more. If Doublewide can find a way to get Driscoll and Gibson and Malecek all together on the same page, watch out world. They are going to be trouble. Jimmy Mickle is amazing. There isn’t any doubt about that. However, Mickle’s brilliance alone isn’t enough to win Bravo games against the top teams. Yet, Bravo was having fun, getting some of their less experienced players some PT, and their attitude felt like one of confidence. They seemed to feel that no matter what, they were going to come away with a bid (which they did, after easily dispatching their little brothers from Denver, Inception, in the game to go). Lance’s return (and Johnson and Watson’s first appearance at Nationals) should help smooth out their issues on offense, and they will have three weeks of rest and practice before having to play again. So to answer the question posed: no. They shouldn’t be worried. – On Bravo, Ben Lohre appeared to be nursing some form of leg injury throughout the earlier rounds, but played through it in the final. – The final was unobserved, and the first half was noticeably chippy, as Doublewide’s defenders (especially Dalton Smith) were incredibly physical on handlers. On the other side of the disc, Gibson had no hesitation in utilizing his contact calls. – Pawel Janas and Ian Toner filled in admirably in the defensive handler roles for Bravo. They got a lot of playing time, and their solid weekend bodes well for Bravo’s depth. In addition, Henry Konker showed out all weekend, playing extremely smart help defense. – In the backdoor game (the play-in to the game-to-go), HIP and Inception played a barnburner, which drew quite a crowd as the final turned into something of a blowout. The last three points were remarkable, with HIP scoring an upwind break to take the lead, but then Inception answering right back with an upwinder of their own to force double game point, which they easily punched in downwind after a HIP turn. As expected, Matt Bennett and Joel Clutton were sublime for HIP, but Inception’s consistency and experience really helped them gut it out in the wind. – Mark Rauls had a great weekend for Inception. He handled, cut deep, and was often the isolation cutter in their pull plays. Don’t be surprised if he does some big things this college season after missing last season. 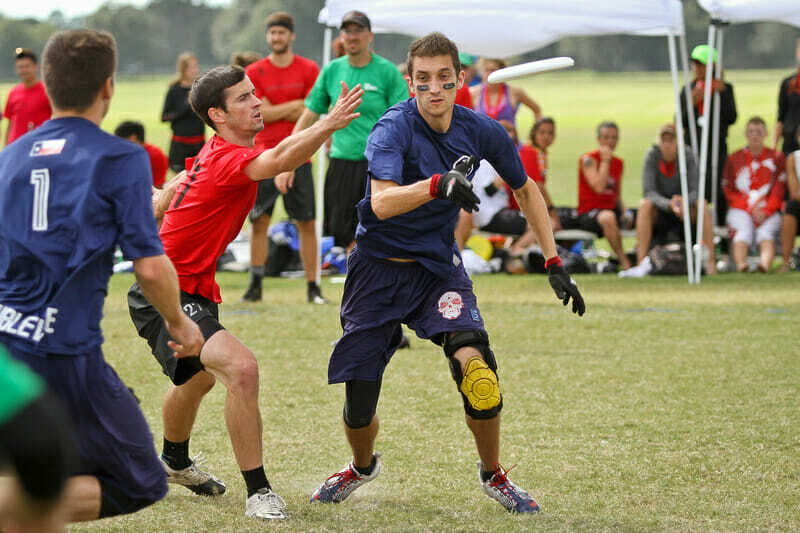 Comments on "Dubs Up: 2015 South Central Men’s Regional Recap"